(Lanka-e-News - 28.Jan.2018, 6.50 AM) ‘President Maithripala , if you wish you may kill us by hanging. That is no issue. But, if you do not use the sword duly , we from Badulla would like to tell you, we shall be starting a massive revolution . You have to take a decision,’ Digital Minister Harin Fernando who is most hurt over the un-doings of Maithripala warned in Badulla. 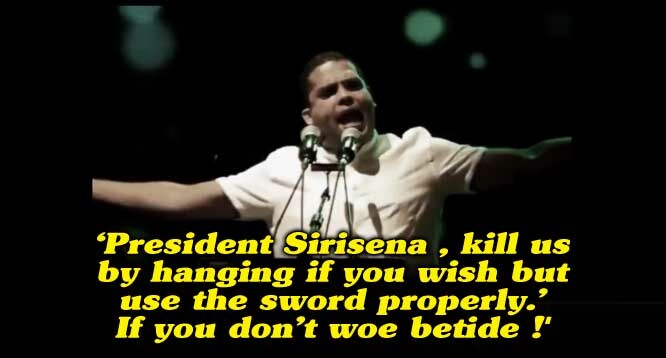 It will not be wrong if it is said , this warning from Harin Fernando is an outburst of his deeply hurt feelings over Maithripala Sirisena’s repugnant conduct which is not in the best interests of the nation. Maithripala who is now launching unrelenting attacks targeting the forces responsible for the 2015 rainbow revolution which in fact elevated him to the presidential throne (contaminated by him now) , has proved beyond any doubt he is by far the most ungrateful human or rather ‘talking animal’ that ever trod this soil. “The cursed shawls of the Rajapakses were removed. It is those who were clinging on to those shawls, now are inside the sarong of Maithripala. This is most sorrowful , and most painful to us. It is we who propelled Maithripala to the presidential throne . The chief minister today is one who was crawling inside the loin cloth of Mahinda Rajapakse. We know , those who worked for Mahinda Rajapakse with heart and soul are today yelling out from within Maithripala’s sarong. This is extremely hurtful and agonizing to us. Your excellency, if you want kill us by hanging .That is no issue, but you belong to us. It is we who made you the president .We say this loudly. Your excellency , we are most hurt and ashamed when we see goons coming to our district and polluting the environment , our teachers are made to kneel down and our members are being assaulted. Of what worth are these portfolios in these circumstances? We feel ashamed to tell these . We are most ashamed. We still trust you though you are requesting votes for freedom . We are also clamoring for freedom from the top of the elephant .But ,please use your sword correctly. If you don’t, we wish to tell you , we shall be launching on a huge revolution at Badulla. Your excellency , we wish to tell a thing to you . That is, when we took you into our embrace , we held rallies reposing trust in you. The estate votes were cast on the faith they had in you. The Muslim population voted for you because they believed you. When rascals like Dilan Perera who is doing your sordid biddings now is casting aspersions on us, how can we just wait? Dilan is the same individual who showed the cup of poison to you during the last presidential elections. When that foe who showed poison cup to you is feeding you with candy balls like a friend today ,what can we say? How long are we to remain silent and tolerate this? Without revealing this , how can we keep our mouth shut every day? Therefore your excellency please take a decision. Comrades , don’t forget some on stage of the SLFP say, because Ranil Wickremesinghe cannot seek presidential election we substituted Maithripala. This is because they have forgotten a salient fact : Can you remember the posters we printed and displayed? Our posters clearly stated ‘Maithri is president , Ranil is Prime Minister.’ If there is any SLFP er who cast the vote for Maithripala , he/she must have been sure if Maithripala is president ,the following day , Ranil Wickremesinghe will be the P.M. Therefore this is not something new or novel. All knew about it and came. Please remember , 6. 2 Million people voted with the intention to make Ranil Wickremesinghe the P.M. Though every riff-raff thinks Ranil Wickremesinghe can be chased out, and pipedreams, that will not happen . Understand that well . That game cannot be played in this area any day by anyone. These are the riff-raffs who worked for Mahinda Rajapakse and did his sordid biddings, who after 2015-01-08 clung on to our sarong and crept in .Hence , can they say things like that to us ?